Welcome again, today we have one of the applications that appeared on the lists of popular programs on Google Play store, it is Vigo Video, it's not just a video editing app but also can help you to make money with sharing your created videos using only an Android phone without need any skills. So, in this article, entitled "Earn money using Vigo Video", I will bring you more this application and how you can use it to edit your personal video and share it to make money, also we will give a direct link to download Vigo Video apk file. 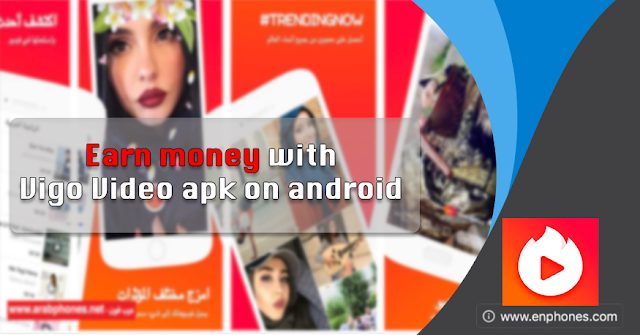 There are many applications and programs that claim to monetize on android phone, you can see that on Play Store, but the most of them are deceptive, so we do not publish profit applications on our site here, unless application is reliable and real, as with Vigo Video - Formerly Hypstar app, which spread rapidly and achieved over 50 million downloads in a very short time. and many users confirmed the payment confirmation from the program and proved to be real and not deceptive and really managed to make money from the phone directly through this Hypstar android. If we go back a bit, we find that Vigo Video is originally named Hypstar previously, and changed its name to Vigo recently, and for his idea it's a program that modifies videos and add many effects to it, before sharing with millions userse within the app, then content publishers can earn money by the number of views and interests in the videos they publish. Vigo Video is one of the best social applications on Android phones, where it combines the publishing and sharing of videos and then make money easely depending on the audience gained a fairly close idea to Adsense and YouTube, so the profit here is related to the interest of viewers and their number and the higher the number of views Profit increased. Along to video publishing and making money, you can also browse millions of posted videos by other users around the world and enjoy a live broadcast. Possibility to produce 15 seconds of short video. Collaborate with creators and discover thousands of exclusive videos. Very easy and decorative effects to show your videos clearly. Beauty filters can be applied to people in the video. Capture multiple videos and merge them with each other. Many of the visual effects and expressive symbols of the beautiful face. Add the latest songs and use them in your videos. As i said in the introduction, Vigo depends on the videos posted to give you points that can be converted to real dollars and then pulled to your PayPal account, that means all you have to do to make money from the app is to record the video, modify it by adding effect and some music or song, then share it with the rest of the users to collect points. The number of points you can get from one video to another is different. tou can got more than 50 points from one video which is about 1$, and you can not get anything from some videos, so try to publish as many videos as you can with professional modifications and good music. 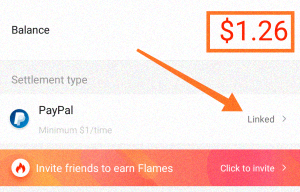 Before you start profiting, you need to register and get your own account, you can do that from within the app after installing it on your phone, also before you can withdraw money to PayPal, you need to link your PayPal account to the app, and you can withdraw the money you earned by publishing the video From your phone.